On the topic of goals, the academic research agrees with your intuition: Having goals improves performance. Intrinsic motivation is the key to growth, but conventional performance management systems destroy that motivation. Great resource; thanks for putting this together! My favourite performance review story, about worker W, W’s manager M, and M’s director D.
W is not doing well on M’s team, and M is concerned. W has a great set of skills that are not being used in their current role. But wait! M has an idea. Team X in the same division has open headcount and needs someone with W’s skills. We’ll move W to team X, open up a head on M’s team, and hire someone who has the skills needed to make M’s team a success. So M puts this plan into effect and W moves over to team X, and coincidentally worker N is available to transfer to M’s team, who has the skills needed. Management success! In response to Eric Lippert’s comment, the answer to the last paragraph is… every company. HR requires reason to terminate. Managers need to have high numbers to inflate their corporate opportunities. Finance uses reviews to manage budgets. Even executives cite the (bogus) numbers when they argue for changes in their departments or areas of interest. Eliminating the annual performance review throws management into a very deep pit from which they cannot escape. Directing peer reviews exposes the manager as nothing more than a scribe or facilitator. (You don’t need very many of those in an organization. Certainly not as many as the number of middle managers.) Eliminating incentives undercuts the only real power the manager has over the underling. To be a real participant in the corporate process requires real-time and up-to-date knowledge of the tasks – something that few managers ever have, and something that formerly-technical people who become managers lose very quickly. I’ve never met a manger who thought s/he could manage without the stick and carrot. But this speaks to the whole fallacy of the modern technical industry: we don’t need managers; we need leaders. We need pathfinders, mentors, experienced producers, and sage advisers in every group. And all we get is middle managers. Absent leadership, every team under-performs, regardless of the management instruments provided by HR or the executives. But with an annual performance review, we can blame all our performance failures on the folks who never had a say in their environment. Phil, I agree with you but I think you’ve failed to mention the real point behind the performance reviews these days: HR and Legal. So many companies use these as their “backup” in the case that a dismissed employee files a grievance of some sort. It is seen as “documentation” that the person was warned, and had ample time to improve before being let go. I think a company wants to frame the performance review in a positive light, but that’s just double-speak when the real goal is to use it as a hammer or as insurance. “Pay according to the market instead.” What ever happened to paying what your worth? Ha!…but I agree with the article in general. Dr. William Edwards Deming went to Japan because at the time he found that American executives had little or no interest in what he was trying to teach. The problem is not the existence of performance reviews. The problem is how poorly they are done and the shallow thinking that goes into them. A merit-based system is the best because it provides incentive to do well. A merit-based system does not innately discourage innovation and the implementation of beneficial new ideas. I understand many of the younger employees are not used to being told their idea is worthless and that they are not putting in the effort they should. But they need to hear it when it is true. They need to realize how little they know and how much they can learn from more experienced employees. If a performance review system is not working like it should, fix it or replace the management (and HR) that screwed it up. 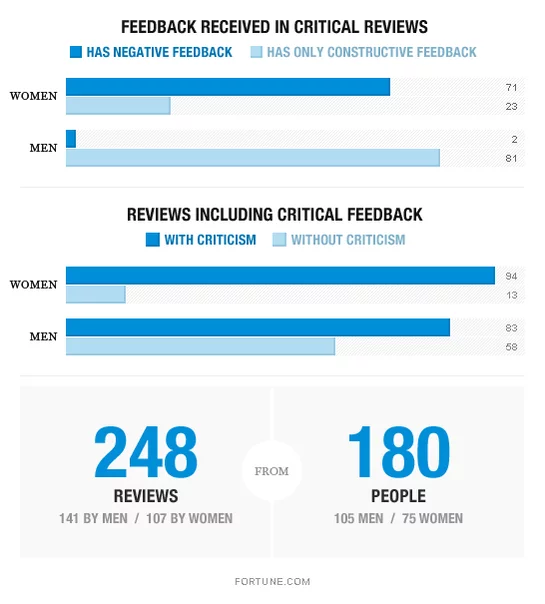 “Negative feedback produces negative results” is garbage. I’ve received a lot of negative feedback / “constructive criticism”; although, at times, not really very constructive. I appreciate it. I welcome it. In fact, I openly and outright ASK FOR IT. Negative feedback is something that can actually make you better. Sure, you have to come to terms with the fact that you’re not perfect… so what? IMO, if you can’t take negative feedback, you’re happy being mediocre at best. How am I supposed to improve without direct feedback. I don’t need soft handed “coaching”. Just tell me what the hell I did wrong so I can fix it, or explain to you why I did it. I look forward to performance reviews. Perhaps because I’ve NEVER had a bad one. And that, perhaps, is because I welcome criticism and negative feedback. I’d suggest if you don’t like hearing negative feedback, you’re likely not really interested in doing your best. Frankly, it’s very selfish. You work to reach a common objective, to produce results as a team, and (hopefully) to achieve something worthwhile to add to your legacy. If you let a little criticism get the best of you, you lack self-confidence and likely the self-awareness required to improve. What ever happened to paying what your worth? Interesting question, I think that it is far to be possible, and in that case, we would require these toxic reviews, right? I would like to hear Phil answer. I definitely agree with employers paying what employees are worth. But let me ask you, how do you determine worth? Note that I’m not saying every company has to pay top of market. But I would suggest indexing to the market. For example, if your company says it’ll pay 95% of market, then that company should evaluate the market on a periodic basis and give raises every time the market value goes up. Raises happen automatically, once per year, when we review market rates. Our target is to pay everyone at the company in the 95th percentile, or top 5%, of the market, regardless of their role. So whether you work in customer support or ops or programming or design, you’ll be paid in the top 5% for that position. Now there’s two possible cases where the worth you bring to a company does not align to the market. You’re worth less than market. You’re worth more than market. In the first case, an employer would be wise to still base your pay on the market otherwise you would leave. Or they should investigate why your worth is not commensurate with the market value. Are you not living up to the position? Or is a problem on the management side that they’re not realizing the value? In the second case, it’s always possible that the value and worth you bring to a company is worth more than the market dictates. Perhaps you bring such bespoke and unique skills to the company that you can’t be compared to existing markets. In that case, you might say that your pay does match the market, it’s just a market of one. What the company has to look at is what the damage to the business would be if you left, and pay enough to keep the risk of that acceptably low and make sure you feel valued. They have to balance that with having enough money left over to continue to operate and grow the business in a sustainable manner. I think this second scenario is actually very rare. In most cases, companies create incentive programs that do not keep up with the market, much less what people are worth. I’m pretty sure Deming wasn’t talking about millennials when he said that performance reviews are bad. You are a textbook case of the survivorship bias mentioned in the post ;-) Also, if you’ve never had a bad review, how do you actually know that you welcome it?